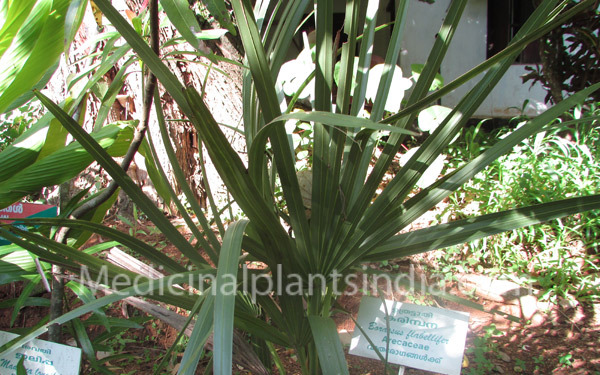 Palmyra palm is a tropical plant, found throughout India. It is a large tree grow up to 30 m high and the trunk up to 1.6 m at the base and little tapered to upward. Leaves are leathery, grayish green, and fan-shaped, about 25 - 40 leaves found at a time, the leaves are 1 to 3 m wide, folded along the midrib; which are divided at the center into 60 to 80 linear- lanceolate, 0.6 to 1.2 m long, and marginally spiny segments. The strong are, 1 to 1.2 m long, with hard spines. The flowers are in big clusters of long, white string-like inflorences. The fruits are coconut-like shaped, and three-sided when young, it becomes rounded in maturity,and capped with overlapping sepals. Young fruit is hollow, contain a soft jelly inside. By tapping the inflorescence we get a product which is the sweet sap called toddy is used as a beverage in India, which is sweet and tasty. The toddy is fermented naturally used as beverage. The non fermented toddy yields crude sugar - jaggery, palm candy, and vinegar are the bye products. To treat gonorrhea, hyperdipsia, skin diseases, burning sensation, inflammation, dyspepsia, flatulence, colic, constipation, intestinal worms, Leprosy and hemorrhages.